Most politicians dream of the exposure the silver screen can bring. Pappy O’Daniel’s came a bit late, however, and was less than flattering. The 2000 film O Brother Where Art Thou featured the scheming, manipulative Mississippi governor Pappy O’Daniel, played by Charles Durning. 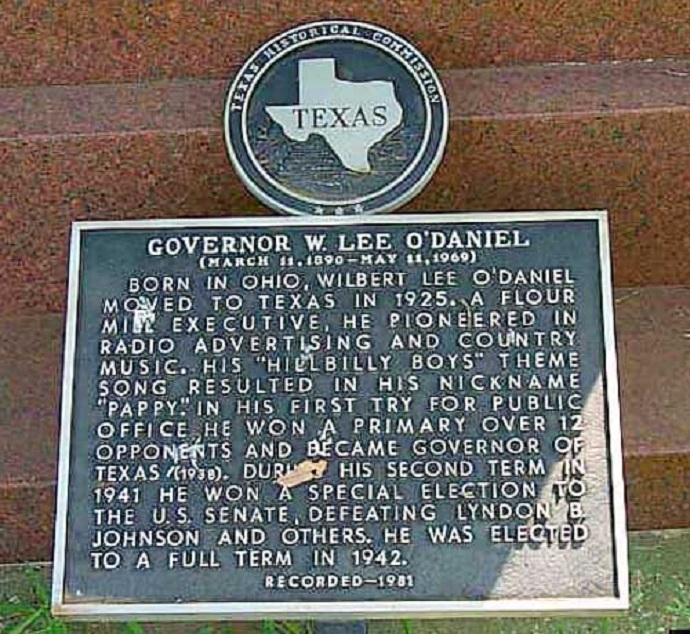 The true-life Pappy O’Daniel was governor of Texas in the late 30’s. But he too owned a flour manufacturing company, and would regularly sing at his campaign stops. And…he was a songwriter as well. You’re listening to Milton Brown and his Brownies with a Pappy O’Daniel original, Beautiful Texas. O’Daniel beat Lyndon Johnson in a special election for Senate in 1941, the only man to ever beat him in an election. He retired in ‘48, and his reason? There was, quote, “only slight hope of saving America from the Communists.” Ennnnnnnnd quote.